It was my turn to bring dessert to our neighborhood potluck, and as often happens, I wanted to try something different. Once in a while another neighbor brings a phenomenal concoction she calls dirt cake, so I decided to give it a try. Dirt cake, I learned, is little more than Oreo-flavored trifle. I tripled this recipe. 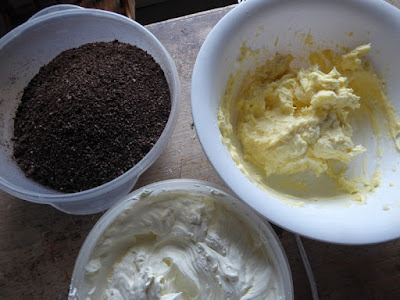 First thing to do is chop up the Oreos in a food processor. 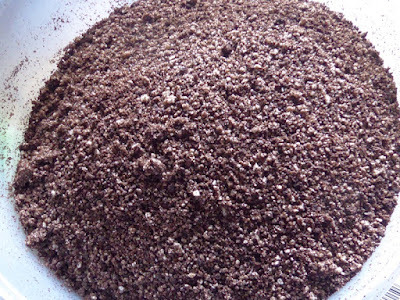 The result does, indeed, look uncannily like dirt. 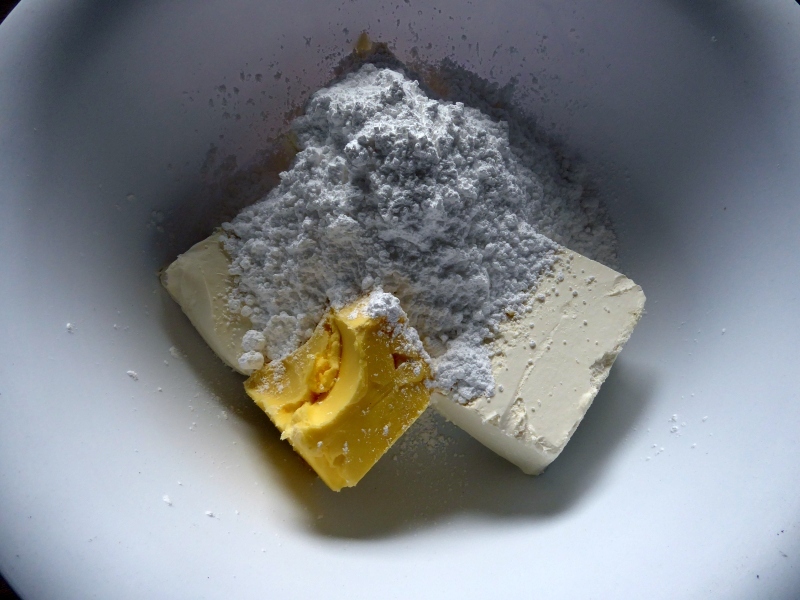 Mixing butter, cream cheese, and powdered sugar. At the bottom is a bowl of whipped cream. 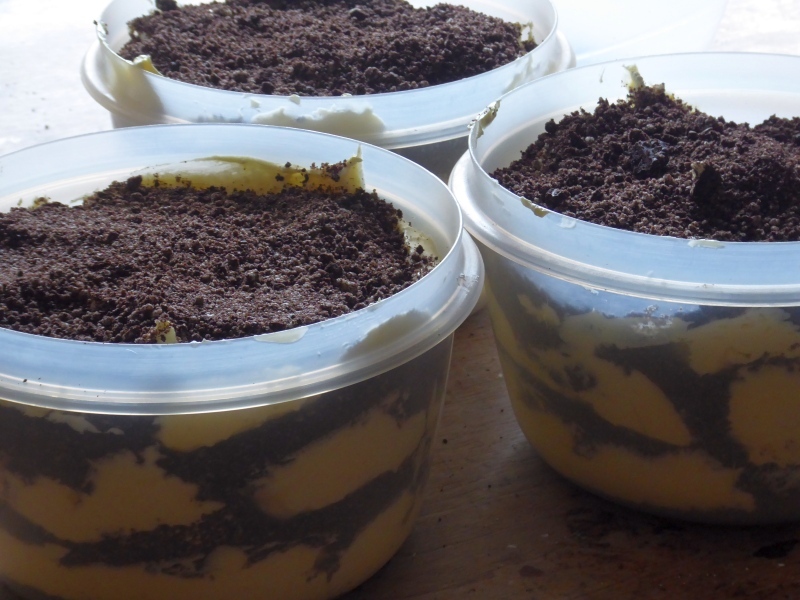 Then I layered the bowl with Oreo crumbs and filling, Oreo crumbs and filling, until it hit the top. Looks almost like I could plant some seedlings in it, doesn't it? Good stuff. One more dish for my potluck repertoire. When I make this, I always add gummy worms, "crawling" out of the dirt. Kids love it!!! The one that I had years ago used gummy worms spread throughout the "dirt". It was quite effective! 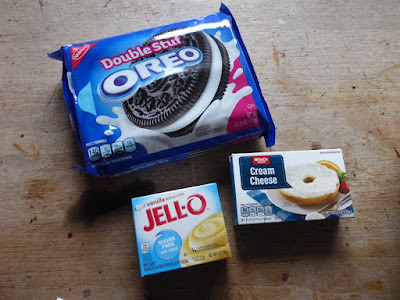 This reminds me of a similar recipe I once made for a handful of kids, except that I placed the concoction in small clear glass pudding cups and to top it off I used gummy worms hanging over the sides, this was a great hit especially with the boys. It has been over 20 years and they still remember it. The key is of course the worms, and the top has to have the crumbs that of course look like dirt. Great fun. Another one chiming in with the gummy worms, except I hide them in the dirt, with the whole thing having been placed in a clean flower pot, with a real plant (roots wrapped in plastic)in the center. Fooled some people this way! 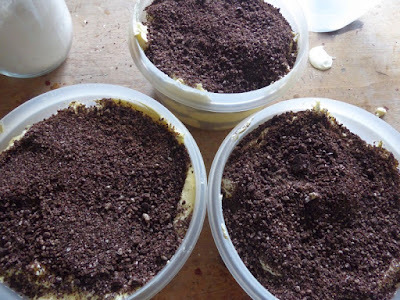 Especially if you don't break up the Oreos too finely--the white filling chunks make it look a lot like potting soil! Is thriftiness only for the rich?